Remember when you had to make brown paper bag mailboxes to collect Valentine's Day cards from all the kids in the class? For the most part, these cards were cheesy, cheap and did their part to make us feel special. We're talking about the incredibly corny puns, large puppy dog-eyed characters and everything you remember from the '50s: rosy cheeks, antique telephones and big bows. But times have changed, and so have the cards. The amount of corniness might be similar, but card-exchanging before the '90s (just like now) was all about keeping up with the trends. If you've ever called Valentine's Day a Hallmark holiday, know that you were pretty much on the money. For the company, February 14 is the second-largest holiday for card giving (after Christmas) — approximately 151 million Valentine’s Day cards are exchanged across the globe. Hallmark first offered a V-Day card in 1913 and began producing them en masse in 1916. 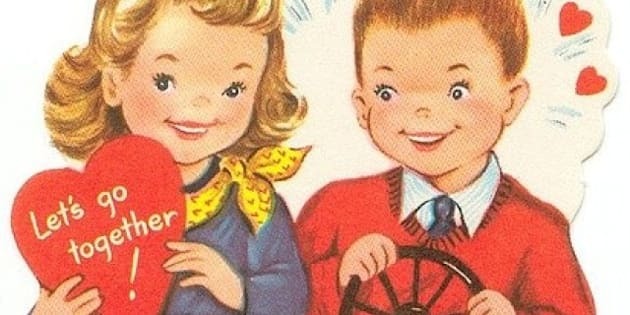 But if you miss the good ol' days and want something nostalgic instead of new, many of these vintage V-Day cards, along with old posters and decorating kits from the '50s are still available online on sites like eBay and Etsy.com. Oh, and we're not talking about prices from the '50s either. Most of these vintage cards start around $3, but we've seen prices in the double digits for one card. If you're not planning to spend the cash, we have the next best alternative: 50 of the punniest and cheesiest cards from around the web. Do you have any of your old Valentine's Day cards? Add them to our slideshow below!